I have been constantly nagging the hubby to get me a dog, insisting that one is a necessity for me, not a want. 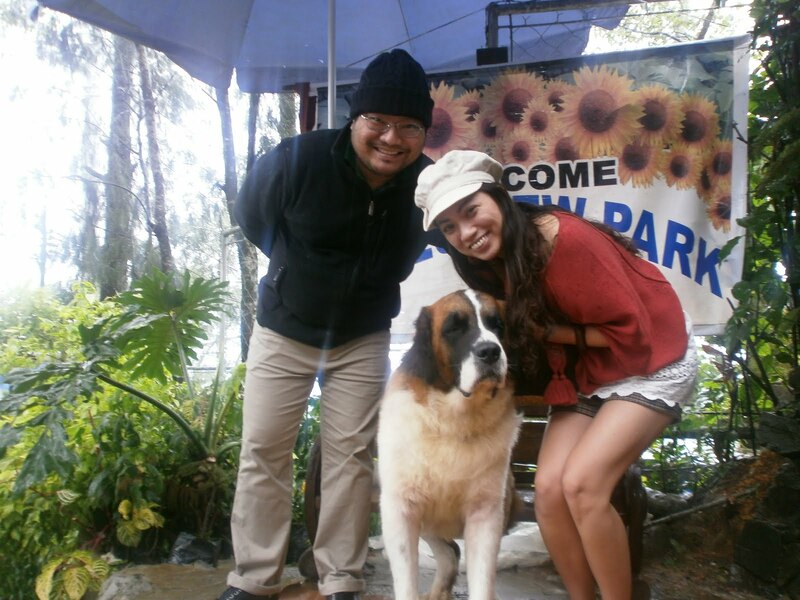 I’m not consistent though, but after our recent trip to Baguio where we saw several St. Bernards posing with tourist, my craving just resurfaced. Hubby doesn’t understand this but having grown up without any dogs, or pets at that, I can’t really blame him. I mean, if you haven’t experienced taking care of one, it would be quite hard to imagine that you can actually care for and love an animal almost, if not as much, as you would any member of your family. See how the dog would naturally cling to me? But for me, this is exactly the case. Since the day I was born, I’ve always been around dogs. I can even remember their names: it was Kukot when I was a baby up til I was four, when she died after getting run over by a car. I was young then but it was a very traumatic thing for me, seeing her limping all bloodied across the street and finally dying. Then it was Browny, Kukot’s offspring, and she stayed with us for more than five years. After her, it was TJ, my dog for seven long years, then Yuki and finally, Tiger, my last pet, who also stayed with me for seven years. Aside from my own dogs, we had several other dogs in the house, each belonging to a particular family member; at one point, all five of us in my family had one dog each. Browny was my first real pet – I was too young to take care of Kukot but with Browny, I can say I grew up with her. She was there for me at night when I couldn’t sleep and she would stay by my feet until I woke up the next day; she would bark excitedly whenever I come home from school or even whenever I look outside the window calling her name. I have this particular memory of Browny, which happened when I was six or seven years old. Back then, the City Pound in our old neighbourhood was relentless in catching stray dogs and putting them in the pound. Unfortunately, Browny was caught one time – we initially thought she was taken by one of our neighbours who were notorious for catching dogs and eating them (yes, yucky but true. And how I wish I was old enough then to report them to the police; back then, I didn’t know there was a law prohibiting consumption of dog meat. I only knew it was wrong, and unethical to do so. But then, these people I am talking about are fugitives from the law – two of them are known murderers and no one would dare cross them. I did get my sort of revenge many years later, in the form of a legal case but that’s another story altogether). 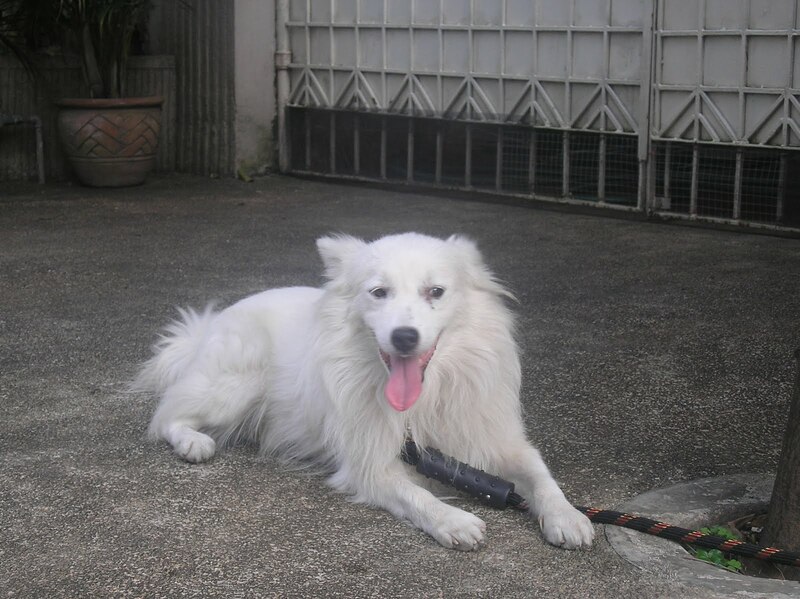 But after a kind neighbour tipped us off that she saw our dog being hauled off by one of the pound’s trucks, my mama and I trudged all the way to the pound on the other side of the Tondo. I almost missed Browny – the cages were labelled by day, representing the day of the week when they were caught. We started off with Monday but by Wednesday, we were kind of disheartened that of the almost hundred dogs we’ve looked at so far, none even resembled our beloved family dog. I was young but I knew Browny was there, and I broke free from my mom’s hand and ran to the next pen – Thursday. I knew we lost Browny on a Thursday even though my mom had all but given up. I looked as far as I could see (mind you, I could barely see past the waist-high wall and steel bars) but I couldn’t see her familiar brown fur. I remember crying out her name softly, “Browny,” before walking away. And that was when I heard her loud bark – the unmistakable bark of Browny, magnified ten times with her delight at hearing my voice. I remember the caretaker saying it really was our dog. No denying – all dogs cry out loudly when they hear their masters coming to get them. Browny stayed with us a couple more years after that, and then she disappeared. We scoured the City Pound as we did before but did not find her. I looked around the neighbourhood to no avail. I knew she was there somewhere – I can hear her howling at night and the next morning, I dared to look inside out neighbour’s gates. And what I saw was something I never wish to see again: I saw skinned bodies of dogs being flame-grilled. I was so shocked I stood there. I was eight and to see your own dog being burned was not a lovely sight. I wasn’t 100% sure it was her, of course. I was probably five meters away and it was dark and there was no fur on the bodies. But my instincts told me it was her. And I cried myself to sleep that night. And many nights after. I probably wished all sorts of bad luck and karma on our neighbours that day. Losing Browny to such a tragic end didn’t deter me from having any more pets but it did teach me to be more careful and watchful. My papa brought home a tiny pup one Sunday night – he had the same brown color, albeit darker and thicker than Browny’s. It was love at first sight. If Browny was my first real pet, TJ was the perhaps the one I have most memories of. He was a shared pet between myself and my sister, and later on, my brother but everyone knew he was my dog; we must have had other dogs than TJ at the time but they all died too young. TJ lived a healthy eight years, quite short, even when converted to human years it would be around 56 years. TJ was a smart dog; sometimes, he displayed intelligence that some humans aren’t even capable of. Case in point: if Browny got caught by the City Pound, TJ was AVOIDED by the City Pound. They did try to catch him when he was younger but TJ always managed to break through their nets; several times, he would even run after the truck and gnaw on the nets until all the other dogs are freed. He was a sort of hero among the other askals roaming the streets. Later on, the City Pound guys decided he wasn’t worth their effort and just avoided him even if he was roaming around freely. Sometimes, TJ would even go out on dates with his “girl friend” (our next-door neighbour’s pet, Disney) and this he did with utmost precision – he would sneak past our gates when my papa would drive to the office or when one of us would go out, and he would run out of sight and come back later in the day with his “girl friend” in tow. When he does something wrong, you can tell by his expression that he is remorseful. He would bow his head and stand in one corner while papa would scold him and he would stay that way until we all fall asleep. What makes him very endearing was the fact that every morning, he would accompany me and my sister to our school bus and then go back home after we’ve left. It’s quite touching really, and he’s the only dog I know who has ever done that. TJ was probably one of the dogs I was closest to: he was certainly the one I was able to take care of the most as I would often give him a bath when I am not at school and I would spoil him with his favorite chocolate every weekend, taken out of my meager allowance. However, TJ was also to meet a tragic end, again in the hands of our neighbours. No, he didn’t end up skinned, broiled and eaten. But his end was nevertheless painful to bear as well. It happened one summer night – call me psychic or what, but I already knew something was wrong when I looked out the window and TJ just looked at me with sad eyes, not even wagging his tail when I called his name. I went to him and hugged him, teary-eyed because he looked so sad and scared. And that was when I saw a suspicious looking torn plastic bag near him. It didn’t even from our house because I swept our yard that day and my mama would kill any of us who dare mess the yard after it has been swept. I never knew what was inside it but knowing how much the thugs in Tondo hate our dog (he once caught a neighbour climbing over our roof, for what reason, I can only guess), I can only imagine it was something lethal to TJ. Suspicious, I called our other dog and when he didn’t come out of the garage where he usually stays, I panicked and called my papa. That’s when we discovered our younger dog, stiff dead in the garage. And I knew then TJ would meet the same fate. I couldn’t do anything but hug TJ that night until my parents had to order me to go to sleep. But I didn’t have to wait long – TJ died a few minutes after I went in. Burying TJ in our garden was probably the saddest day in my life; half my life he’d always been there (I was 14 when he died and he was with us seven years). I didn’t get my own dog for more than four years, overcome with grief. Of course, I got over TJ’s death in time. And when my mama felt I was ready, she asked me to go with her to the pet store and pick out a dog – I went home with a white and furry spitz whom I called Tiger (plus his brother Jimuel which went to my sister). Tiger was perhaps the family’s favourite pet – he was all sorts of charming and witty. He wouldn’t eat vegetables but liked corned beef. He wouldn’t come near any of us when he’s dirty and always welcomes a bath. He was the only dog I knew who loved jumping up and down tables and sinks and would prefer sleeping on a rug outside our kitchen door. And all the neighbourhood dogs feared him and his brother and our third dog, a Belgian Malinese. Even the bigger dogs of our neighbours stayed away from them and walking them one day, I realized why. As my sister and I were walking the three dogs, a big dog started growling at me. I was scared – he was easily three times bigger than Tiger and we could never have outrun him. But what surprised me was when Tiger faced him off, baring his tiny teeth and growling back. Then all three of our dogs circled the big dog as my sister and I scampered off to safety. I never knew what happened after we left but I heard the big dog howling in pain back to his house while our three dogs found their way home as well, all looking haughty and proud, the way they do when their ears are all flicked up and their tails raised. Sometimes, I think Tiger forgets he is a dog. He doesn’t eat dog food; he doesn’t like getting dirty and he likes being hugged and tickled in his ears. And he gets jealous – really, really jealous. Perhaps the reason hubby doesn’t want to get a dog is because even after more than two years of dating and visiting me at home, and even living there for half a year after we got married, Tiger never liked him. Tiger would always growl at him. He did try to bribe my dog with chocolates but Tiger was smart – he would come near Ipe and eat the chocolates and when he was done, he’d start growling again. And he would get in a fighting mode, all ready to attack Ipe when he would see him hugging me or even standing near me – how cute was it to have your dog jealous of your husband? It was funny and endearing and makes me smile just thinking about it now. I left Tiger in my parent’s house after I got married. He remained my faithful dog until the day he got sick and died of old age. So you see, my history is littered with dog memories. It’s been almost five and a half years that I have been pet-free; to be more specific, since the day I got married and moved out of the family house. It has been a very long five years which I long to break sometime soon – hubby should expect some heavy nagging in the days to come. Yet another thing we have in common! I grew up with dogs too and also wrote a blog about it (http://www.deecoded.com/2009/03/marley-and-me.html). I enjoyed your stories about your dogs, especially the one about TJ. I distinctly remember you talking about Tiger and Ipe when we were both still in AP. Haha! a longer story about TJ was published in the Inquirer when I was in high school (I wrote an essay when he died; was still part of the Junior Inquirer staff back then). Wow I didn't know you were a junior staff in Inquirer! Nice!